With nearly 30 years of experience in stockholding of Lsaw Pipe. Coating mills apply pipe coatings to protect the line pipe from corrosion. ERW, LSAW, SSAW and other welded steel pipe, what does that mean? Now there are many types of steel tubes, each type of steel pipe is a different name, the following will be introduced to the next common.ERW welded pipe: the high frequency ERW pipe, the hot rolled wide volume as raw material, after pre bending, forming, welding, heat treatment, diameter, straightening, cutting process, and the spiral compared with short seam, high size precision, uniform wall thickness, good surface quality, bear high pressure, but the drawback is that the only production of small diameter and thin wall tube, easy to produce a gray leaf spot weld, lack of fusion, groove corrosion defects. At present, it is widely used in the field of urban gas, crude oil, finished oil transportation, etc..SSAW welded steel pipe, spiral submerged arc welded pipe is coiled its forward direction and shaping of the center line of the pipe forming angle (adjustable), side shaping welding edge, the weld into spiral line, the advantage of the same specifications can produce a variety of diameter specifications of steel, raw adaptation range is larger, weld joint can avoid the principal stress, stress better. The disadvantage is that the poor geometric size and weld length compared to the straight pipe length, easy to produce cracks, porosity, slag inclusion, solder side welding defects such as welding stress is tensile stress state. 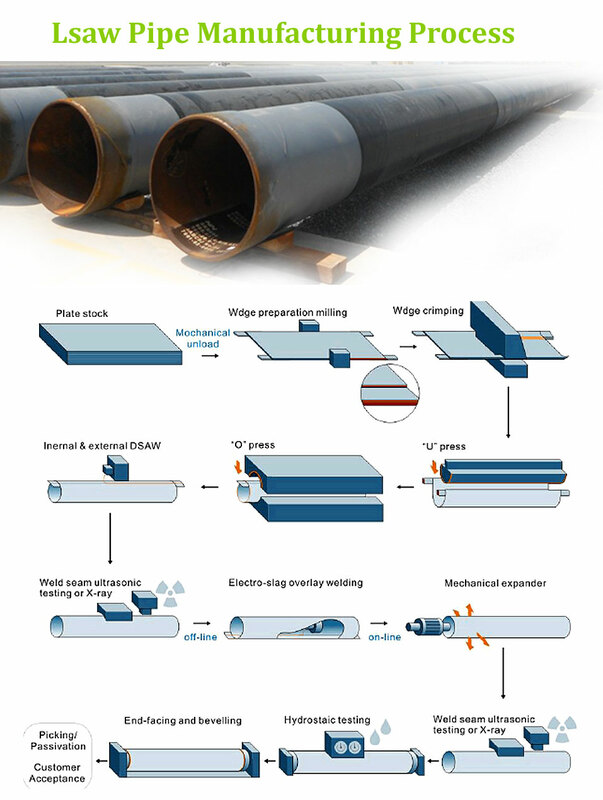 General oil and gas long distance pipeline design specification for spiral submerged arc can only be used for 3 categories, 4 categories of regions.Welding of LSAW steel pipe: the longitudinal submerged arc welded pipe is in a single sheet of Zhonghou as raw materials, steel in mold or forming machine of medium voltage (volume), using double-sided submerged arc welding and expanding size and production. The product specification range is wide, the toughness, plasticity, uniformity and density of the welding seam is good, which has the advantages of large diameter, thick wall, high pressure resistance, low temperature resistance and so on. In the construction of high strength, high toughness, high quality long distance oil and gas pipeline, the steel pipe are mostly large diameter thick wall thickness longitudinal submerged arc. According to the API standards, in large oil and gas pipeline, when the class 1, class 2 areas of the alpine zone, sea, city populated area, longitudinal submerged arc is the only designated for tube type.